Goodreads Summary: Sophomore year broke Clementine Williams’ heart. She fell for her best friend’s boyfriend and long story short: he’s excused, but Clem is vilified and she heads into summer with zero social life. This book had a lot of buzz around it, and the night that I picked it up to read, it seemed like it would be the right mix of poignant and sweet. 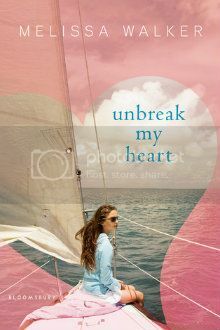 Unbreak My Heart explores different sides of heartbreak and the pain that any loss can cause, but as the title suggests, it also shows healing. Clementine Williams' sophomore year was fine...until people found out that she had fallen for her best friend Amanda's boyfriend. Because of that, Clem was shunned by her friends and looking forward to a summer with no plans, until her parents tell her that they will be sailing along the river. Clem is looking forward to escaping into her room with her music, but her family's first stop on the journey changes that. She meets a boy her age, James, in a store, and soon they are running into each other quite frequently. But Clem knows she isn't a good person - after all, her lifelong friends still won't talk to her. Neither her parents nor her little sister Olive can cheer her up. But could James be just the medicine that her heart needs? Unbreak My Heart is told with a dual narrative, alternating pieces of Clem's sophomore year with the events of the summer on the river. I loved that the story unfolded gradually and that we still learned more about Clem as the book went on. I also enjoyed getting to know her family. Her parents were involved and caring, and her little sister Olive was adorable - just like what I always imagined a little sister would be like. Then there was James. I have to admit that I am a sucker for tortured artists - and with James being an incredible artist who was hiding secrets, I found him incredibly swoon-worthy. Their relationship felt real and was developed over time, and it was by no means issue-free. I appreciated how Clem gradually realized what was really bothering her and started learning how to be okay with the way thing were. And as for Ethan...even though he seemed perfect at first, he is also a great example of how the perfect person isn't always perfect for you. Even though this book was full of emotion and definitely worth the read, it wasn't as moving as I was expecting. Perhaps it was a case of my expectations being too high, or perhaps it was because I had issues with some of the characters. Amanda disappointed me, and to be honest, I wish that Clem would have stood up for herself better. Even so, the story was sweet, and I enjoyed reading about the summer on the river. Whether you're looking for something about first love or recovery from first crushes, Unbreak My Heart is a great summer read. Now that I've read this, I will definitely have to read Melissa Walker's Small Town Sinners and any other books that she might write!